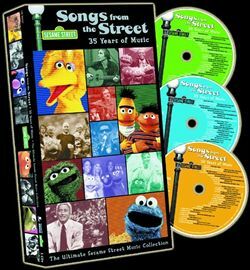 Pre-order your copy of the Sesame Street boxed set, "Songs From The Street". The collection will feature the best celebrity and Muppet music from the past 35 years. In a time of musical segmentation and stratification, there remains a place where artists of all genres can play on common ground: "Sesame Street." In celebration of the 35th anniversary of the seminal -- and seminally hip -- children's show, on Sept. 2, Legacy/Sony Wonder will release the three-CD boxed set "Songs From the Street." The commemorative box features 63 digitally remastered artist tracks, 22 of which are being released for the first time and 12 of which are no longer commercially available. The set, which also includes an extensive booklet with liner notes from Grammy-and Emmy-winning songwriter, composer, producer Christopher Cerf, kicks off a year-long campaign sponsored by "Sesame Street" creator company Sesame Workshop. Slated to roll out throughout 2004 are a new teen-oriented clothing line, a separate video project, a possible Hollywood Bowl concert and a new series of classic artwork. "'Songs From the Street' is a celebration of one of the most creative and influential programs in the history of children's television," says Michele Anthony, executive VP of Sony Music Entertainment. "We're very proud to be associated with Sesame Workshop as they mark their 35th year in children's entertainment." Indeed, from its inception in November 1969, "Sesame Street" began building a musical guest roster without rival. The likes of Johnny Cash, Ray Charles, Celine Dion, Lena Horne, Billy Joel, B.B. King, R.E.M., Paul Simon, James Taylor, Steven Tyler and Stevie Wonder have all stopped by to mingle with the Muppets. 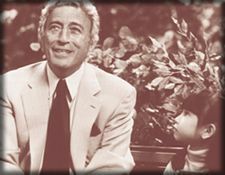 "I'll tell you why 'Sesame Street' is so cool," says longtime fan Tony Bennett, whose 1995 performance of "Little Things" is featured on the new set. "When I play with my quartet, the music is very much in the moment. And they are doing the same thing at 'Sesame Street' with words. It's spontaneous; it comes right from the head and the heart, and it is just wonderful." 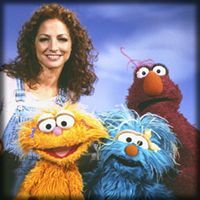 "Being on 'Sesame Street' was one of the biggest highlights of a career that's had many; I got to sing with Grover -- how cool is that?" Trisha Yearwood says of her 1998 version of "I'm Talkin' Love." "There is a magic about 'Sesame Street' that endures no matter what your age. I'm honored that I got to be a part of it." Cerf says, "We learned early on that if we write 'little kiddie' songs, the older kids and parents wouldn't mind the songs, and then you get a much broader audience. The music is crossover music; that's part of the mission. We've always tried to do things parents think catchy and funny, but never at the expense of the child." Witness, for example, Cerf's transformation of Melissa Etheridge's "Like the Way I Do" into the letter-of-the-day salute, "Like the Way U Does" in 1996. "Once it started airing, people would come to my concerts with a big letter U on their T-shirts," Etheridge says. "My fans still request the version, and I say I don't know it anymore -- so it's good that they'll now have a chance to have the TV version with this album." According to Arlene Sherman, senior creative consultant to "Sesame Street" and a former longtime executive producer, "Everything we've done musically at 'Sesame Street' has been deliberate so it would be palatable for parents. "We wanted to appeal to things parents might be listening to at the moment and expose kids to a variety of styles, and this CD reflects that breadth very well," Sherman says. To be consistent with this core philosophy, Sony is marketing the $49.98 set to adult music fans first, with children as a secondary target. The promotional fanfare kicks off Aug. 25 with a direct-response campaign, which will be followed by an aggressive retail debut. "In some cases, we will end up with traditional boxed-set placement; in some stores we will be located along with the kids product," says David Pierce, Sony Wonder executive VP/GM. " 'Sesame Street' as a brand commands a tremendous amount of retail space in a lot of categories." Tamra Seldin, VP of marketing for Sesame Workshop, notes, "The album is the natural cornerstone of the 35th anniversary campaign. We've used music through the years to educate, and that music has stayed with the adults. It's the emotional connection of the show." Sometimes an appearance on "Sesame Street" has also been career-defining. "We've had the privilege of playing at Woodstock, opening for the Rolling Stones and getting a Grammy nomination, but more people come up to me and comment on our appearance on 'Sesame Street,"' says Chris Barron of the Spin Doctors, who performed "Two Princes" in 1993. "To be included on this album with these musical giants, I'm thrilled all over again." Music will also have a starring role in the preschool-focused "What's the Name of That Song," a commemorative VHS/DVD slated for release in January that weaves 12 clips of musical guests and culminates with a celebrity pastiche of the anthemic "Sing." Additionally, Pierce says Sony is "trying to pull together" a video complement to "Songs From the Street." 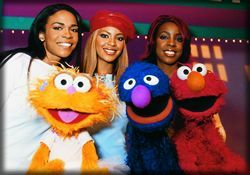 Although the nonprofit Sesame Workshop has released countless titles into the early-childhood market, its only other project with mass-market appeal is 1999's "Elmopalooza." Released in conjunction with a television special, "Elmopalooza" has sold 172,000 on audio and 229,000 on video/DVD, according to Nielsen SoundScan/VideoScan. The opportunity to be included in a "Sesame Street" tribute is sweet for "Elmopalooza" alumni the Fugees, whose 1998 performance of "Just Happy to Be Me" is featured on the new set. "It's funny, because kids see me now, and they know me from 'Sesame Street,"' former Fugee Wyclef Jean says. "Doing the show was great; it gave me a childhood vibe. Every time you do something, you want it to be simple enough for a little kid to understand. Then it's easy to take it to the world."